How is the best way to use the last five minutes of a class? As a faculty member trying to cover an important block of material, do you speed ahead to get to the end of the story? As tempting as this might be, one expert in effective lecturing would say no. He was quoting Todd Zakrajsek, a noted clinical psychologist from the University of North Carolina and expert on dynamic lecturing. Zakrajsek joined Fournier in presenting a faculty development workshop for Samford faculty April 6. “The focus was on dynamic lecturing, and how to take a more balanced approach to presenting information,” said Fournier. About 70 Samford faculty enrolled in the session. “It was about Samford faculty investing themselves to become better teachers,” he added. For faculty who have honed their lecturing approach over the years, “there still are ways they can make small changes to become more effective without reinventing themselves,” said Fournier. And then there’s that willingness to resist the temptation to try to get one more thought in before it’s time to go. Zakrajsek presented two workshop sessions based on his book Dynamic Lecturing. He underscored the value of breaking up lectures with short periods of activity such as having students talk about the subject among themselves. “After 12 minutes, stop the lecture and do something else,” he said. Educators began moving away from lectures as the primary teaching tool in the early 1990s, Zakrajsek noted, and the trend has continued until the present day. Some have abandoned lectures altogether. 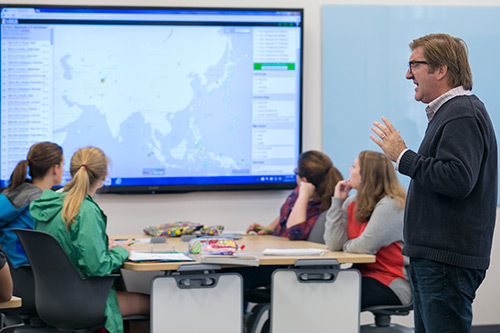 Are interactive, engaged classes more effective than the lecture approach? “That is not a defensible statement,” he said. Zakrajsek said an effective class has three steps: get and maintain the students’ attention, make sure they understand the topic, and inject something of value or interest that they will remember. The program and another session April 5 for new Samford faculty members were sponsored by the CTLS, McWhorter School of Pharmacy, School of the Arts and Samford’s Quality Enhancement Program.